Breast cancer is the leading cause of death in American women 30 to 70 years of age. 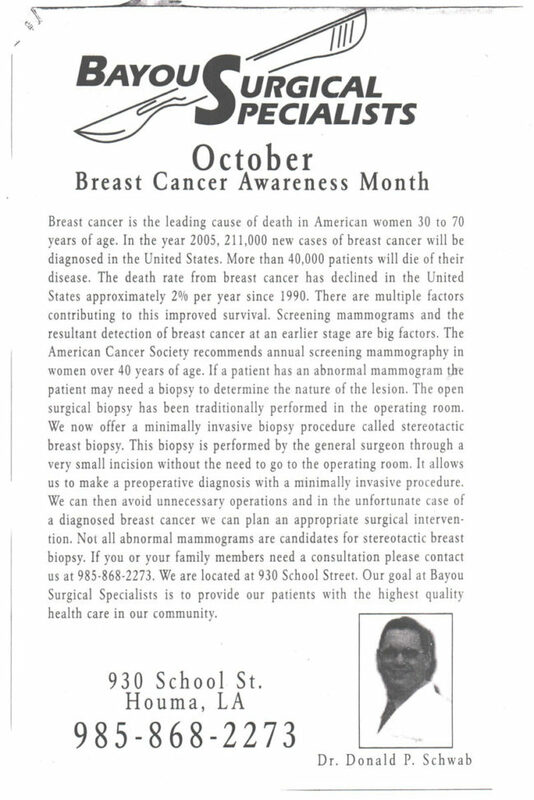 In the year 2005, 21,000 new cases of breast cancer will be diagnosed in the United States. More than 40,000 patients will die of their disease. The death rate from breast cancer has declined in the United States approximately 2% per year since 1990. There are multiple factors contributing to this improved survival. Screening mammograms and the resultant detection of breast cancer at an early stage are big factors. The American Cancer Society recommends annual screening mammography in women over 40 years of age. If a patient has an abnormal mammogram the patient may need a biopsy to determine the nature of the lesion. The open surgical biopsy has been traditionally performed in the operating room. We now offer a minimally invasive biopsy procedure called stereotactic breast biopsy. The biopsy is performed by the general surgeon through a very small incision without the need to go to the operating room. It allows us to make a preoperative diagnosis with a minimally invasive procedure. We can avoid unnecessary operations and in the unfortunate case of a diagnosed breast cancer we can plan an appropriate surgical intervention. Not all abnormal mammograms are candidates for stereotactic breast biopsy. If you or your family members need a consultation please contact us. Our goal at Bayou Surgical Specialists is to provide our patients with the highest quality health care in our community. See the original news article written by Dr. Donald P. Schwab below.